It's very common in Photoshop to work with multiple images inside the same document, with each image on its own layer so we can blend and combine them in various ways to create interesting designs, collages or effects. It's easy to select and open multiple photos at once from inside Adobe Bridge, but normally, Photoshop opens each photo in its own separate document, forcing us to manually duplicate, copy or drag each image from its own document into the main document we're working on. In Photoshop CS4, Adobe introduced a great new time-saving feature to Bridge - the Load Files into Photoshop Layers command. If you know in advance that you're going to be working with multiple images inside your document and you know which specific images you'll need, Photoshop can now open and load all of your images into the same document and automatically place each image on its own layer! Here's how it works. 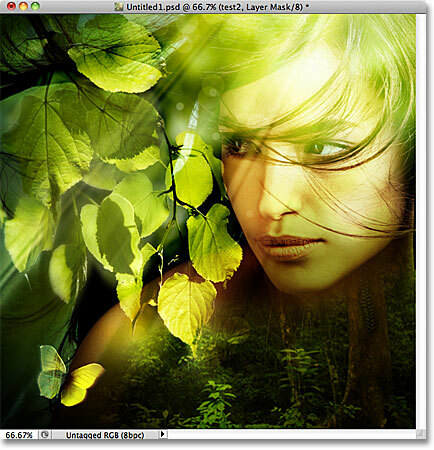 You'll need Photoshop CS4 or higher to follow along (I'm using CS5 for this tutorial). Clicking on the photo on the left to select it. Holding down Shift and clicking on the last image to select all three images at once. In Bridge, go to Tools > Photoshop > Load Files into Photoshop Layers. All of the images have opened inside a single Photoshop document. 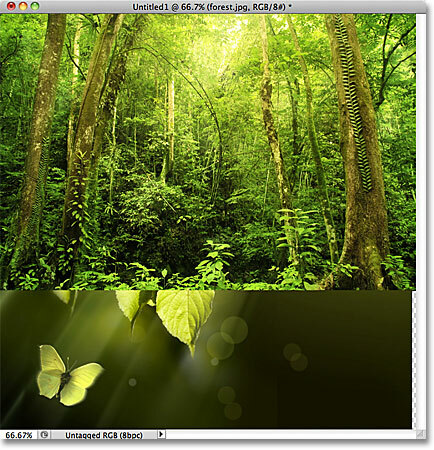 Each photo has been added on its own layer inside the Layers panel. The name of the image is now the name of the layer it sits on. 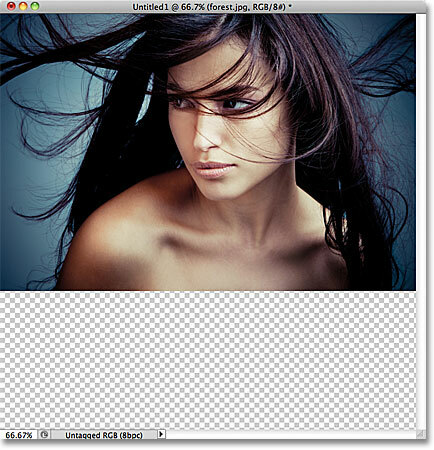 Holding Alt (Win) / Option (Mac) and clicking the layer visibility icon for the "woman.jpg" layer in the Layers panel. Only the selected layer is now visible in the document. Deleting the ".jpg" file extension from the end of the layer name. All three layers have been renamed. With each image already on its own layer in the same document thanks to the Load Files into Photoshop Layers command, we can spend a bit more time being creative with our designs and less time on less interesting tasks like dragging or copying images from one document into another. All three images combined into one. And there we have it! That's how to open multiple images as layers in Photoshop! Visit our Photoshop Basics section for more tutorials on layers, selection tools, shapes and other essential Photoshop skills!